After much labour, we have finally produced the Flexcit pamphlet. It is available as a free download from this link, or the permanent link on the sidebar. If you want hard copy, it can be ordered from the Bruges Group for £5.00 including p&p. The pamphlet summarises in 48 A-5 pages the online book which has now had in excess of 50,000 downloads. It sets out how the UK can leave the European Union and is intended to show that an orderly exit is plausible and practical, and can be largely risk-free. Leaving the EU, we acknowledge, is a big step. There can be no serious dispute that a botched process could have dire results. Export of goods and services is vitally important to us. Even in trade with the rest of the world, the EU is often the regulatory portal through which we access other markets so it has a huge influence on non-EU trade. Any major disruption could do serious harm to our economy, well beyond just our trade with EU Member States. It could even drive us into recession. There is no margin for error. We cannot afford to get it wrong. To achieve a trouble-free exit, we must have an exit plan. Without that, we believe the "leave" campaign will not succeed. But we expect our plan to have more than just an effect on the campaign. It would have a direct impact on the subsequent negotiations, if we decide to leave. Our plan, therefore, has to be accurate, honest and pragmatic. And we start with a basic premise. After nine treaties and 40 years of political and economic integration, there can be no clean break. Unravelling in a single step is not going to happen, and certainly not without compromises. This is a point that cannot be made too strongly. Behind the scenes, having been deliberately shunned by the major campaign groups and the media, that idea has already gained considerable traction. Thus we get the Telegraph today reporting that, "according to one analysis (i.e., Flexcit), developing a Britain-specific deal is likely to take five years, running way beyond the two-year period between a country triggering the Article 50 exit clause and it being released from the European treaties". "As such", the paper says, "it is likely the UK would adopt a model similar to Norway’s as holding position, before gravitating to a more bespoke arrangement, according to one scenario under discussion" – the scenario posited almost exclusively by Flexcit for the past two years. This reflects a crucial point in our plan - that negotiations will not take place in a political vacuum. Nor will they start with the formal exit talks. Rather, they will be continuation of a political process that will have started well before the referendum. This means that our negotiators will not have a free hand. Theirs will not be "blank piece of paper" exercises where shopping lists are drawn up without restraints. Nor will there be room for theoretical assumptions. Negotiators will have to deal with the political realities of the day. And they will be forced to respond to the limitations imposed on them. Another point is that these will be negotiations – i.e., a process which involves exchanges of views. It starts with each of the parties setting out their opening positions but, to achieve a satisfactory outcome, both sides will have to listen to each other. Compromise will be essential. Commentators who suggest blue sky options that do not take account of these political realities are being unrealistic. Proposals cannot be taken seriously unless they are politically attainable and publicly acceptable. They must have regard to the political constraints and be acceptable to those with whom we are negotiating. To expect otherwise is pointless. With this in mind, we stress that great care should be taken with exit scenarios based on economic models. Estimates cannot be any stronger than the assumptions on which they are based. Weak assumptions are poor foundations for any plan. Dazzling predictive models and complex calculations cannot remedy inherent flaws. Then, we must point out that all solutions must fit with others. There is no point defining certain policies if they create irresolvable problems elsewhere. Partial solutions are not an answer. An exit plan has to work as a whole, even if that requires adopting sub-optimal policies in some areas in order to achieve the larger objectives. Within these constraints we have to face some unavoidable realities. Firstly, the plan has to ensure continuity of trade with the EU and the rest of the world. No matter how attractive the eventual outcome, exit will never be tolerated if the immediate effect is to damage trade and plunge us into recession. In our view, that means we must – in the short to medium term – stay in the EU's Single Market. However, the EU has made it abundantly clear that if we want to stay in the Single Market, acceptance of the principle freedom of movement is non-negotiable. We can abolish freedom of movement or we can stay in the single market. We can't do both. On that basis, we have come to the conclusion that, in order to leave the EU and secure the medium and long-term gains that accrue from so doing, we must accept a short-term compromise over freedom of movement. To add to all this, there is the timescale to consider. Under Article 50 of the Lisbon Treaty, which defines the exit procedures, negotiations are set to last two years. Although we could get an extension, we believe it would be unwise to rely on a longer period. This creates an inherent problem. Complex trade negotiations usually take a long time to conclude – sometimes a decade or more. Thus, we suggest adopting an off-the-shelf solution rather than a bespoke agreement. That confronts another reality. Brexit presents an existential threat to the EU. If it concedes an exit deal to the UK that is better than it could achieve within the EU, other Member States might be tempted to leave. A "better deal for Britain" could collapse the entire EU. For that reason, it will never be offered. Thus, we feel that holding out for unachievable perfection runs the risk of losing the referendum and staying trapped in the EU. We make whatever compromises are needed to get out quickly and resolve outstanding issues once we have left. Stage one: this deals with the immediate split, for which there are several broad possibilities. There are the options we set out in what we also call "The Market Solution", there is what we call the "Swiss" (bilateral) option, or there is the World Trade Organisation (WTO) option. Our first stage comprises three options, all aimed at ensuring continued participation in the single Market. First is the "Norway Option" in which we rejoin the European Free Trade Association (EFTA) and trade with the EU through the European Economic Area (EEA). Whatever initial option we choose, we have to remember that membership of the EU involves much more than trade. We cooperate in a huge range of activities, from student exchanges to the management of airspace, and much else. Before reaching a final agreement, we have to decide on the activities we want to continue, and the terms. Once we have the right exit option and have defined the areas of post-exit co-operation, we have enough to finalise an exit agreement with the remaining EU Member States. But this is only the start of a longer process. Stage two: looks at immigration and asylum. Since we have to keep freedom of movement for the time being, we have to work out how better to manage the flow of people into our country. Here, there are many things we can be doing, to pave the way for a longer-term solution. We will need to take action at a global level to deal with third country immigration, seeking amendments to the Geneva Convention on the Treatment of Refugees, and the 1967 Protocol. We will also have to change or withdraw from the European Convention on Human Rights. We can also limit immigration from the EU by addressing the "pull" factors that make it so attractive to come to this country. Stage three: here we deal with the drawbacks of EEA membership. We start with the dominance of the European single market by Brussels. As long as the UK is on the edge and Brussels is at the centre, we will have a subordinate status. This is not acceptable in the longer term, so we propose a more equitable market structure. What we want is a community of equals in a "European village". To administer the market, we propose replacing Brussels with the Geneva-based United Nations Economic Commission Europe (UNECE), on the lines proposed by Winston Churchill in 1948 and again in 1950. UNECE already plays a prominent role in global regulation and trade and is the logical choice. Stage four: is one of rebuilding independent policy. Illustrating how an independent UK might operate, we look at foreign and defence policy, agriculture and fisheries. We also explore environment policy, and then the linked subjects of climate change and energy. We conclude with financial services and the so-called "digital market". Stage five: we suggest a new framework for our global trade policy, with an evaluation of areas that are ripe for improvement and exploitation. This is organised into an eight-point programme which opens the way for us to break out of the EU cul-de-sac and rejoin the global trading system. Stage six: here, we argue that there is little point in leaving the EU if we then return powers to a Parliament which gave them away in the first place. We must stop this happening again. Thus, we offer ways of restoring democracy, bringing both central and local governments back under the control of the people. 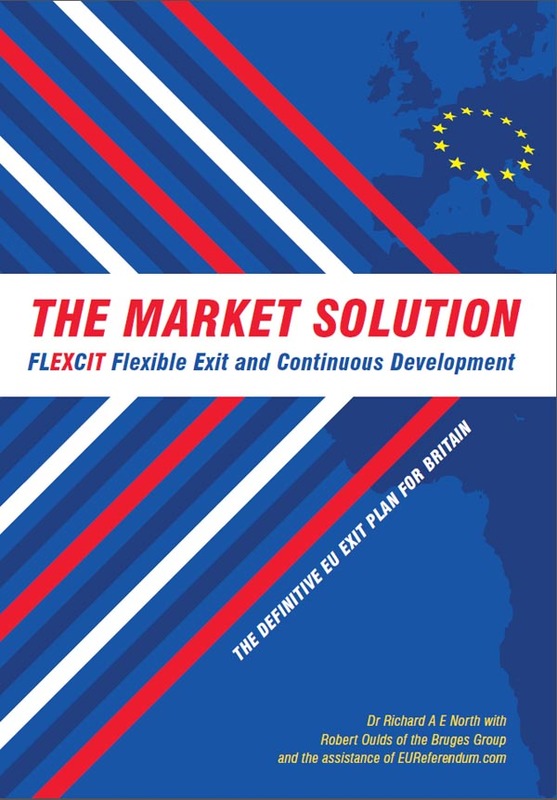 In conclusion, we explain how leaving the EU becomes a process requiring continuous and flexible development - from which Flexcit takes its name. That repeats our central point: leaving the EU is not a single event but a multi-stage process. Even after we have left the EU, the process may take many years to complete, as we seek a steady, measured divergence rather than a "big bang" separation. The aim will be to keep the best of our agreements with the EU while freeing it to follow its own path. In short, by leaving the EU, we are not ending a relationship. We are simply travelling separately. This is not isolation but an agreement to do many of the same things in a different way, all to our mutual advantage.